Today represents the start of one of our favorite events, the CES. This is our second coverage of CES so stay tuned because more updates are on their way! Anyway, today Nokia showed off their newest Nseries widescreen mobile device, the Nokia N800 Internet Table. 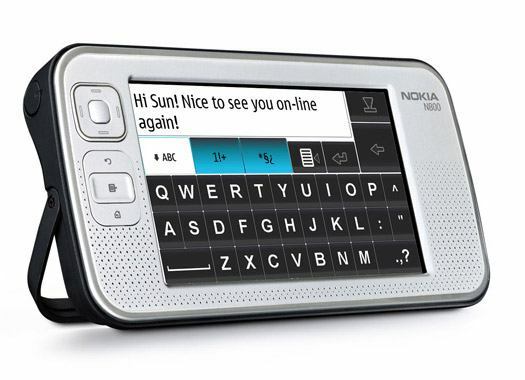 The N800 comes equipped with Nokia's desktop Linux based Operating System featuring a large display (800x480 pixels), full QWERTY keyboard, Wi-Fi, Bluetooth 2.0, built-in webcam, which will work great with the integrated Skype. According to the company, the N800's battery will last about 10 days in standby or 3 hours in intense Internet browsing mode. It is a great phone.With a more dedicated camera it would have been the best. I think it is only for internet browsing. GPRS capabilities for Blackberry like service would have made it a must have for me. I still don't want to carry my cellphone, blackberry and this device instead of a laptop?